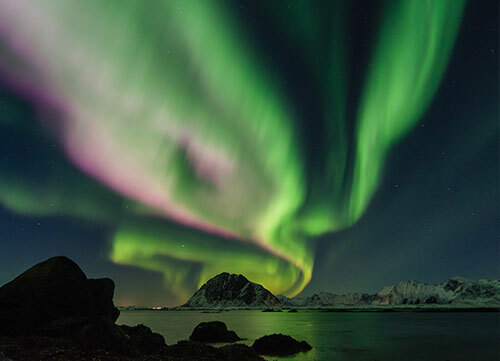 Witnessing the magical spectacle of the Northern Lights is often described as a magical and once-in-a-lifetime experience, and we can help you make the most out of it. As your tour specialist, Port and Porters offers unforgettable Northern Lights Tours on board our luxurious international cruises. Our Northern Lights Tour is far from just looking for the Aurora Borealis, as it has so much more to offer. Below are some interesting details about the Northern Lights and what our itinerary has for you. The Northern Lights, also known as Aurora Borealis, are caused by collisions between charged particles from the sun’s atmosphere with gaseous particles in the Earth’s atmosphere. The different types of gas particles colliding cause variations of coloured lights, which appears in various forms of dramatic displays, from shooting rays to streamers that light up the dark sky with a bright glow. Below are some additional details you may want to know about the Northern Lights. January, February and March are the most popular months for Aurora hunting. These three months are usually the mid-winter period in the north. The frequency of clear nights and long durations of darkness provide many great opportunities to catch the Northern Lights. The best time of the night to watch the auroral displays is usually during local midnight, subject to a clear sky. The lights are more vivid and brighter when the skies are darker. However, there are few places that allow darker skies. Thus, by being onboard a cruise, it provides the perfect environment to see the lights with skies at its darkest. In addition, our cruises will conveniently sail you into the auroral oval, which may not be easily accessible by car. This increases the probability of witnessing the gorgeous display of glowing lights, without the disruption of artificial light. Our cruise provides an outdoor observation deck that offers an unobstructed view of the of the Northern Lights, allow you to fully experience the dancing the lights directly above you. Port and Porters Northern Lights Cruises offer many attractions at the various ports during the 13 days cruise. Each port offering a different touch of culture, and activities that will keep you excited during every stop. Stavanger’s most entertaining museum, housed in an old cannery. This city was once home to more than half of Norway’s canning factories, which provided more than 50% of the town’s employment in 1922. The museum brings you on a journey through the whole 12-stage process from salting to threading, smoking, decapitating and packing. Also known as Tromsdalen Church, was dedicated on November 19, 1965. This eye-catching architecture was designed by architect Jan Inge Hovig. It is visible from the Tromso Bridge, Tromso Sound and even by aircrafts when landing in Tromso. The glass mosaic created by artist Victor Sparre, is one of his most prominent works, consisting many symbols that generated many attentions from visitors. This beautiful and magnificent hotel has a total of 20 rooms beautifully decorated with snow and ice. It may sound and looks cold, but warm, thick and comfortable sleeping bags will be provided to keep you well and make the stay an incredible and unforgettable experience. The hotel also offers a wide variety of winter activities, such as ice-fishing and a trip with the husky dog team. Alta has the largest concentration of rock art in Northern Europe, created by people who were part of the hunting-fishing economy. The rock art comprises of painting and cravings made between 2,000 to 7,000 years ago. It was inscribed on the World Heritage List (UNESCO) in 1985 as the only pre-historic cultural heritage monument in Norway. The very first buildings in Bergen was located in Bryggen. 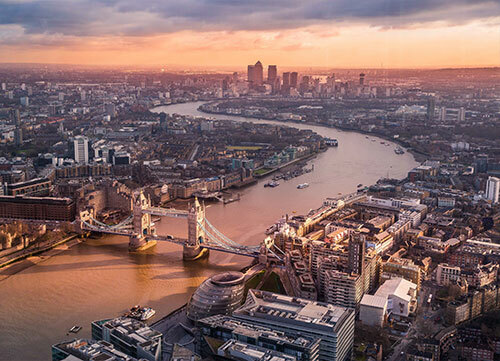 The city has faced many spells of fire, the great fire in 1702 in particular. It was then rebuilt on the foundations that existed since the 12th century. This means Bryggen is technically still the same despite the passing centuries. 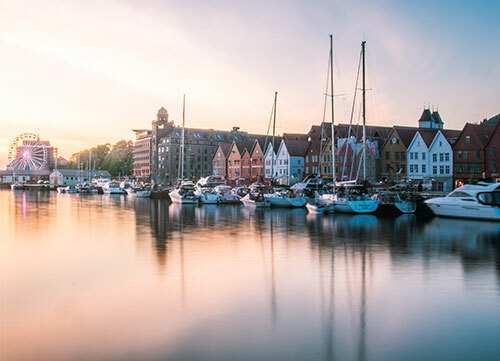 The city has been given a place on the UNESCO’s World Heritage List, which consists of the old Hanseatic buildings and wharf, as well as best known designed urban areas from the Middle Ages in all of Norway. Our Northern Lights itinerary is expertly and specially designed with guest experiences in mind. We often hear people talking about the mesmerizing Northern Lights, or coming across them on the Internet, but there is no better way to experience their ethereal beauty than from the deck of our luxurious cruises. Hop onboard with us and enjoy our 13 days Northern Light cruise to the far north during Norway’s winter, and witness what few others see. From the magnificent snow hotel in Kirkenes to the sledge dog ride. Each port of call provides a uniquely different experience from attractions to culture, which you should not miss. Click here to know more about our full itinerary. While the Northern Lights tours that Port & Porters organize bring you closer to witnessing the mesmerizing beauty of the aurora borealis (Northern Lights), the thing about traveling is that you need experience different things and push boundaries to create meaningful memories for yourself. The list below features a number of enjoyable activities that will enhance your experience along with the Northern Lights cruise. Stavanger provides countless opportunities for adventure. 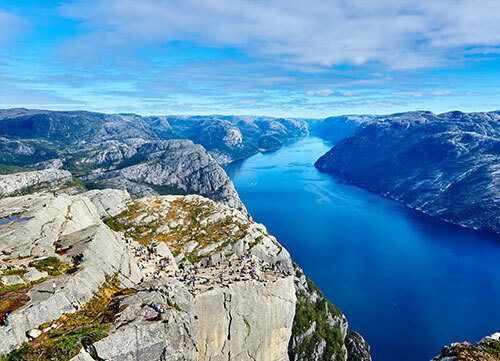 Challenge yourself by taking a six-kilometer hike up to the Pulpit Rock (Preikestolen) which is a steep cliff that rises 604 meters above the Lysefjorden. 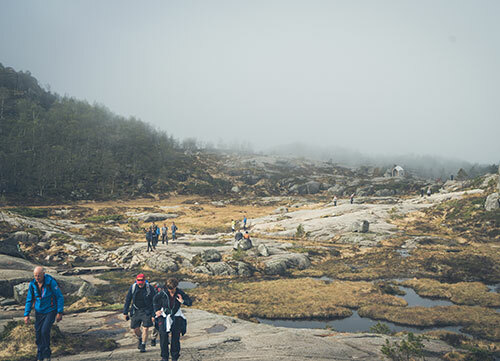 The hike is one of the most famous hikes in Norway. Its exceptional views, relatively simple hiking paths and easy accessibility from the town of Stavanger made this natural attraction so appealing to the people. While Tromsø is recognized as the Northern Lights capital of Norway in all tours, this beautiful city offers more than just that. At Tromsø, you get to enjoy a dog sledding trip into the white scenery, through the stunning environment filled with mountains and snow. The total distance you will cover is estimated to be 15km and there’s nothing as fulfilling as rocking in a sled out in the wild while being led by a bunch of energetic huskies. What a way to experience Norway’s Arctic wilderness! The city of Narvik is surrounded by awe-inspiring mountains and it offers a variety of sporting activities/tours in the scenic environment. Apart from being identified as a place with clear skies for observing the northern lights, Narvik is also known as an ideal base for off-piste skiing. While Skiing through the exciting terrain, you even get to enjoy the scenic views over Ofotfjord which is an experience that will last a lifetime! Norway is renowned for its dreamlike mountain ranges, the boundless stretch of glacier landscapes and its amazing Northern Lights tours. While this stunning environment is put in the limelight, let’s not neglect the food that Norway has to offer. For you to really experience a country, it is essential that you taste their local food and authentic Norwegian food is something you do not want to miss out. Here are some food highlights in Norway that you might want to check out during your Northern Lights cruise. Brunost or “Brown Cheese” can be found all over Norway in fairly large portions, especially in breakfast buffets. It looks distinctive as it looks like cheese but its brown in color. So why is it brown? Brunost is produced through thorough boiling of a combination of milk, cream, and whey to ensure that the water evaporates. The milk is caramelized during the heating process which gives the cheese its sweet taste and its unique brown look that never fails to entice Norwegians. Brunost can be used as toppings for sandwiches, bread or even waffles, so give it a try during your Northern Lights tour! During the course of your Northern Lights tour, you should definitely try out the King Crabs in Norway. Who doesn’t love king crabs? Their spectacularly juicy claw meat ranked them as one of the best Norwegian delicacies by the locals. In restaurants, these high-protein crabs are often served in many variations with delicious sauces and spices that will entice your taste buds. Indulging in the king crab like this is an absolute joy that you should not miss out on in Norway! Reindeer steak became one of the most exciting food in Norway because the meat is so lean and delicious that it will not disappoint you. During the 13-Day Northern Lights tour, the cruise will be harbored at the port of Bergen. At Bergen, it is an absolute must to visit Bryggen Tracteausted which is situated in the historical area of Bryggen. The restaurant has a rich history that goes back to 1708 and its ambiance makes you feel like you are in one of those days. 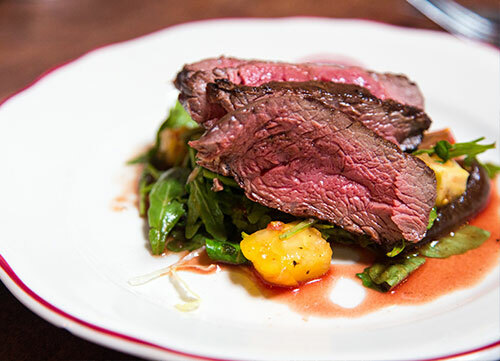 You definitely can’t go to Norway without trying the Reindeer steaks their menu! To ensure that you are well prepared for the 12-Day Northern Lights tour, we created some packing tips that will come in handy when packing your baggage. Appreciating the northern lights demands a lot of patience and quality clothing to stay warm during the process. Besides all the clothing required to keep warm, it is recommended to have additional outfits like winter boots and waterproof trousers that will aid you in your walking during the Northern Lights tour. Accessories like Sunglasses is also essential during the tour because it helps to protect your eyes from the snow glare which are harmful to your eyes. While the Northern Lights blaze across the night sky, it would be a waste if that mystical moment is left unphotographed. Thus, it is important to pack your camera, along with a tripod or monopod and multiple SD memory cards to record down moments that you can revisit them several years later. As the cold environment depletes batteries at a fast pace, it is advisable to pack an extra charged camera battery so that your camera doesn’t fail on you during the Northern Lights tour. Lastly, it is also good to pack your camera equipment in a plastic bag so that they are kept dry and warm for optimal functionality. Dark images need a longer exposure, where even the slightest movement can leave you with a blur picture. Inexpensive smartphone stands work equally well too. Recommended to get one with bendable legs that allows you to prop up on a backpack, rock, or wrap it around a fence. Auto mode for this kind of photography is not ideal. Try setting to manual mode instead. Some smartphones do not have pre-installed manual mode in the native camera app. Thus, for such situation, it is recommended to download apps like ProCam that offers manual controls. Set your ISO to 800. If the ISO is too high, you may get graininess in your pictures. Coming soon! Do keep a lookout.